The Honda Accord has been a staple in the Japanese automaker's lineup for well over a quarter of a century. That's a long life in the automotive industry, and it's consistently been ranked in the top echelon of cars over its life. This is a huge achievement, especially in light of the fact that so many others have fallen by the wayside. The Insight has gone through a number of changes, and Honda can't seem to make up its mind. It started out very niche and then changed to a more Prius-like look. The new car is a bona fide sedan. Though we don't necessarily like the way the new Accord looks, the hybrid version is as good as its ever been in terms of efficiency, space, and driving thrills. But the new kid on the block, the Insight Hybrid, is the model's first foray into the sedan segment. The question is how do these two stack up against each other, and why do they both exist? Let's take a closer look. First of all, the exteriors aren't all that different from one another. The front end on both cars have long, thin headlights with that signature chrome bar that spans across the fascia. The Insight's chrome bar splits the headlight housings, adding a bit more of a racy look to the front, and the "H" emblem sits below it, as opposed to the Accord's, which is embedded in the chrome bar. The intakes are similar, as are the lower grille portions. The hood on the Insight is a bit more contoured, but the windshield size and side mirrors are virtually the same from this angle. There's a bit more distinction here, but the overall shapes are still very similar. A view from the back shows more differentiation. Taillights are vastly different, in that the Accord's are larger and have larger backup lights in the middle of the bracket-style brake lights. The Insights' are simpler and thinner with smaller backup lights. Both have small decklid spoilers and wide license plate cutouts, while the Accord's rear window is clearly wider and a bit taller. Overall, the Insight Hybrid looks more cohesive and appealing. The Accord actually looks a bit awkward from some angles. The Accord Hybrid's interior (above) looks a bit more premium with the full-width dash trim and the high-mounted touchscreen infotainment system. Rather than a flat storage cubby in the center stack (like the Insight's, shown below), the Accord Hybrid has a retractable door compartment. Both cars have solid ergonomics and physical knobs for audio and climate control. The sporty three-spoke steering wheel on both cars look virtually identical to one another, as do the gauges on both cars. The dash on the Accord Hybrid provides for a more airy atmosphere than the Insight's, which seems thicker. Both cabins are attractive and contemporary, and owners will be satisfied with either model's interior comfort and layout. 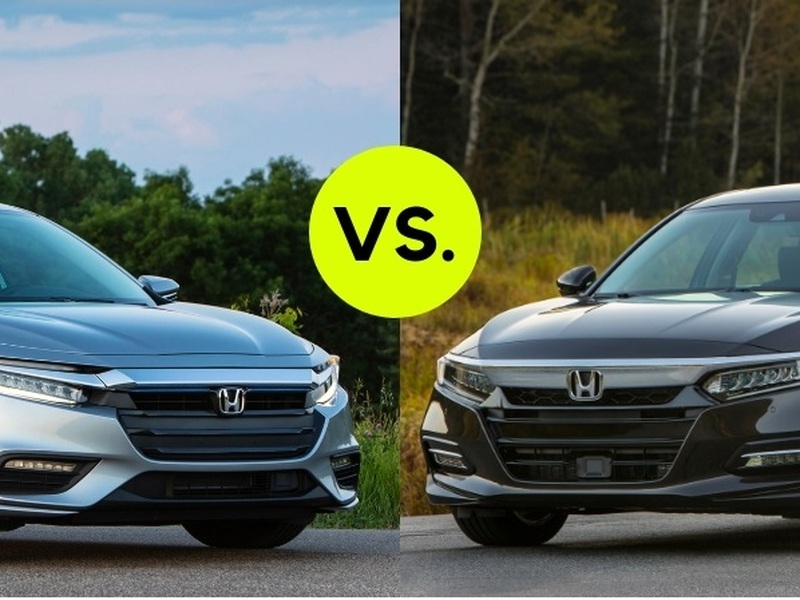 You really can't go wrong with either of these cars when it comes to pep and efficiency, but you have to prioritize what aspects about the powertrain are more important to you since on car gets better efficiency than the other, though the difference might not seem like much. It really does depend on how much you drive. The Accord has quite a bit more power (61 horses), but the Insight is lighter. Both drive very well and provide smooth acceleration, though the Accord sounds a tad more refined than the somewhat noisy Insight when pushed. The Insight is the clear leader when it comes to efficiency, nailing 52 mpg combined over the Accord's 47. In the end, it's a matter of needs and preferences, but there's no clear winner here. The Accord Hybrid's size and power mean it has to sacrifice some efficiency. In terms of appearance, we think the Insight is better styled, but both cars are attractive inside. If comfort and space are the priorities, go with the Accord and spend just a little bit more. If it's efficiency and style you want, stick with the Insight. Either way, you're making an excellent hybrid choice.